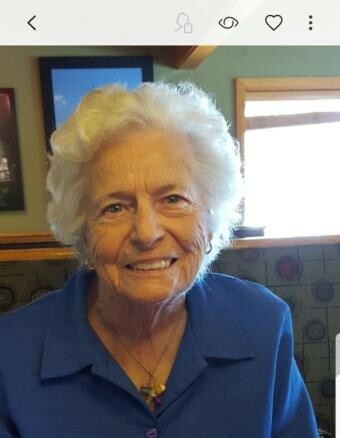 Edith Mae Lucas Gott, 96, of Watha beloved wife, mother, grandmother, and friend passed from her earthly life on Tuesday, March 19, 2019 at New Hanover Regional Medical Center. She was born June 25, 1922 in Putnam County, West Virginia, the daughter of the late Henry H. and Ava Bailey Lucas. Edith was preceded in death by her husband, James Monroe Dale, who died while serving in the military during WW II. She later married Ernest C. Gott who died in 2009. Edith is survived by her children, Gary Dale (Peggy), Larry Gott (Sandra), Deborah Ward (Joe), David Gott, Daniel Gott (Debbie); ten grandchildren; 19 great grandchildren; five great, great grandchildren; many extended family and friends, all who loved Edith. She was a faithful member of Watha Baptist Church. Edith loved with all of her heart and her radiant smile brightened the life of everyone she knew. She was a dedicated and hard worker her whole life and was willing to do anything for anyone at any time. Faith, family, food, babies, and flowers are the words that come to mind when thinking of Edith. She could spend hours, even long into the night, praying, cooking, and crocheting. To her, age was just a number and nothing could stand in her way. She was blessed to live in her own home making biscuits until her last brief illness. Edith led a blessed Christian life and was ready to go to her heavenly home. A graveside funeral service will be 11:00 a.m. Saturday, March 23, 2019 in Potts Memorial Church Cemetery, Willard, NC with Pastor Gary Dale conducting the service. Condolences and shared memories may be sent to the family by selecting Tribute Wall or Guestbook.